It’s easy to forget life before CAD but I was recently reminded when clearing out the attic. In a dusty poster tube, I found the drawings I had prepared for the various building consents we needed when we bought our house as a derelict wreck in the early nineties. Carefully drawn on drafting film, the A2 sheets took more than a few evenings and I well remember needing to track down a local specialist to make the necessary copies. I also remember groaning when the Council sent them back for minor amendments – back to (literally) the drawing board. Things were quite different when submitting later plans. By then I was using 2D Design so these drawings (some getting on for 20 years old) now reside on a hard drive. They were quick to produce, easy to amend and served several purposes. The porch design was drawn to scale so it was worth drawing the windows and door exactly as they needed to be. These were then extracted from the main page, scaled up and printed as the workshop drawings I needed to make the joinery. No more trawling for copy shops either, the council were happy to accept emailed .pdfs. The speed, accuracy and efficiency of it all was breathtaking. The NC Framework for D & T includes using CAD as a requirement at KS2 and at KS3. TechSoft have developed courses specifically aimed at introducing CAD for KS2. The courses are being rolled out now as both free ‘twilight’ taster events and as full-day sessions at our Head Office in North Wales, centres around the UK and in partnership with our new friends at Fablab, London. Full details are on our website: www.techsoft.co.uk/training. We are always on the lookout for new venues so if hosting a session at your school would work for you then please get in touch. These courses aim to enable teachers to start using TechSoft 2D Primary software in the classroom straight away and provide them with the background they need to help children develop good habits and avoid mistakes. 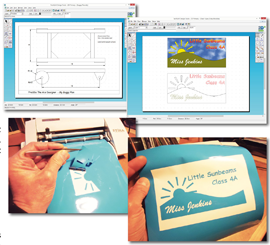 CAM output is also covered using the Roland Stika for packaging projects, stencils, decals and iron-on logos. It is amazing what children can achieve with these simple, inexpensive resources and often a useful reminder about the fundamentals of CAD/CAM. A full site-licence for 2D Primary costs only £95+VAT and has unlimited roll-out to any computer owned by the primary school and it lasts forever – no annual subscription fees or renewals to worry about. If you or a KS2 colleague would like to check out the software then click on download to obtain a free trial which allows you to draw and save, but not to output.